When it comes to the basics in home design, few things are as beloved and style-friendly as old hardwood floors. If you’re fortunate enough to have these beauties in your Tulsa home, then your floor makes it easy for you to do as you wish with the rest of the house. For instance, your furnishings and décor can be contemporary or traditional. The only downside to hardwood floors is keeping them looking their best. Here are a few tips for restoring natural wood flooring. Restoring natural wood flooring may be as easy as giving it a good deep cleaning. To start the process, sweep your floor thoroughly with a soft bristle broom. It’s important to use a soft broom because stiff bristles can scratch your floor. The next step is to use a vacuum to suction up the dirt and debris that can be hard to reach like the stuff that accumulates in the corners and between the floorboards. You can then mop the floor using a microfiber cloth and a concentrated cleaner. Just be sure to buy a cleaner that’s formulated for hardwood floors specifically. When it comes to cleaning wood floors, you should never use steam, water or vinegar. Also, avoid products like oil soap that form suds. If the floor is especially dirty, you may want to hire a professional to clean it. Depending on the state of your hardwood floor, you may just need to give it a new finish. You can even do so without sanding it. To do this, purchase a laminate floor renewal kit, which includes everything that you need to give your floor a new finish without changing its color. Once you’ve completed the process, it takes 24 hours to dry and seven to 14 days to cure. You can also use a floor reviver. This product restores a wood floor’s current polyurethane finish. Floor restorers are another available finish option, and these will let you give your floor a satin or glossy finish. Restorer and reviver products feature a thick consistency that will fill in any small dings or light scratches in your hardwood floor. In some cases, the best option is to refinish your wood floor. If your floor is especially dry or grimy and has wide gaps or deep scratches, then we recommend that you refinish it. The process is labor intensive. It is also time consuming. Depending on the amount of work required, you can expect to pay something like $3 to $4 a square foot. Homeowners often take on the task themselves. This is definitely doable, but research the process so that you’ll know what you’re in for. Plan to sand, patch, stain and add a top coat. According to the experts, it may take a full weekend or more to refinish a wood floor smaller than 500 square feet. 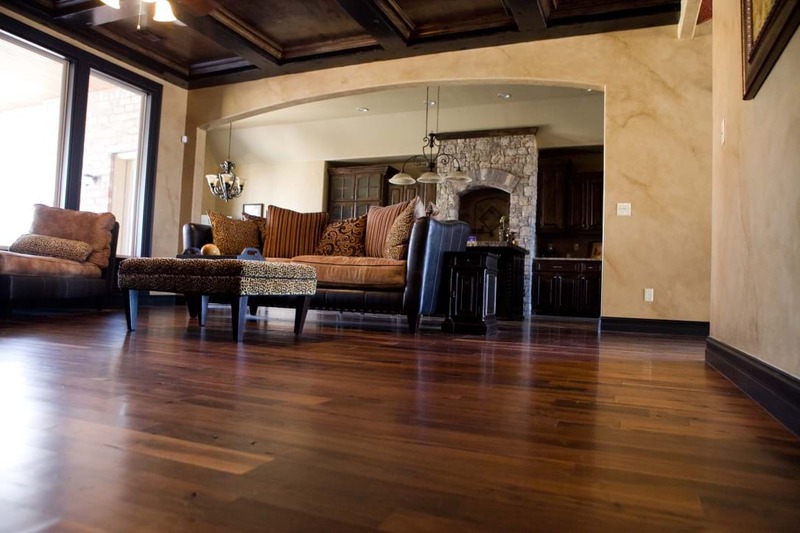 What are the Benefits of Restoring Natural Wood Flooring? Restoring wood flooring is cost-effective. It is also a great way to preserve the integrity of your home while giving you an easy base to work with when it comes to choosing a décor style. In fact, hardwood floors make it possible to include several different decoration styles in your space if you’re all about being eclectic. Why Do Hardwood Floors Require Refinishing? Wood floors become dull over time, making them less appealing visually. Wear and tear also result in scratches, dings and dents. A wood floor with surface damage often looks dirty or marred, which is likely to leave you feeling as though you need to clean it more frequently than you do. Hardwood flooring may become damaged by water or a cleaning chemical, requiring refinishing. The good thing about wood floors is that in many cases, you can fix them with restoration. Wood flooring is a quality investment due to the flexible styling that it offers as well as the ability to restore them when they become worn or damaged. If your home is in need of professional hardwood flooring services, contact Brucke Wood Flooring in Tulsa, Oklahoma today!